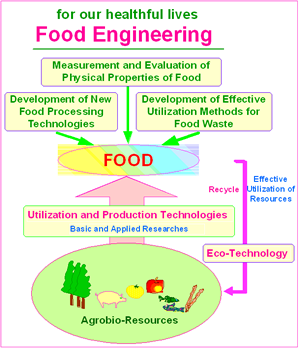 The laboratory of Food Engineering has been pursuing basic and applied researches on various engineering aspects for use in the food industry. Current subjects include technological developments for processing, preservation, sensing and effective utilization of food. Yoshio Hagura, Hiroaki Takahashi, Kiyoshi Kawai, Shiho Oikawa, Takashi Mawatari. (2011) Quantification of grittiness of yogurt using flow characteristics indexes. Procedia Food Science. 1, 594-600. Kiyoshi Kawai, Haruna Kawai, Yuka Tomoda, Keiko Matsusaki, and Yoshio Hagura. 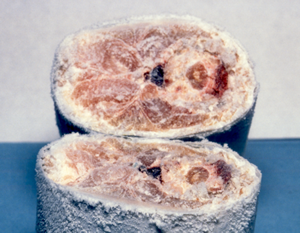 (2012) Effect of pre-dehydration treatment on the in vitro digestibility of starch in cookie. Food Chemistry, 135, 1527-1532. Kiyoshi Kawai, Keiko Matsusaki, Kana Hando, and Yoshio Hagura. (2013) Temperature-dependent quality characteristics of pre-dehydrated cookies: structure, browning, texture, in vitro starch digestibility, and the effect on blood glucose levels in mice. Food Chemistry, 141, 223-228. Kiyoshi Kawai, Midori Toh, and Yoshio Hagura. (2014) Effect of sugar composition on the water sorption and softening properties of cookie. Food Chemistry, 145, 772-776. Nathdanai Harnkarnsujarit, Misako Nakajima, Kiyoshi Kawai, Manabu Watanabe, and Toru Suzuki. (2014) Thermal properties of freeze-concentrated phosphate-sugar solutions. Food Biophysics, 9, 213-2181.